Hawthorn, sometimes called haw, mayhaw, or thornapple, has been used as an herbal medicine in Europe and by Native Americans for thousands of years. The botanical name for the species used in Dia-Slim is Crataegus laevigata and we use the berries, instead of the twigs, bark or leaves. The berries are rich in nutrients and antioxidants. Hawthorn berries are also high in NO or nitric oxide, which improves vaso-dilation of blood vessels and may improve sexual performance. For instance Viagra works by increasing nitric oxide production to improve blood flow. One of the reasons we use the hawthorn as an herbal ingredient in Dia-Slim, is that hawthorn has shown exert beneficial effects on the heart and blood pressure. Another reason is that research on hawthorn berry shows that it can lower blood lipids, or clear fat from the blood. This hypolipidemic power of hawthorn berry makes it excellent as a natural remedy for high blood lipids. (2) We have combined hawthorn with 8 other organic herbs to improve blood pressure, reduce blood lipids naturally and help you break the sugar, salt, fat habit so common in America. No all people who crave sugar and want to lose weight have heart problems, but hawthorn in Dia-Slim is used to increase the overall antioxidant effect of the herbal formula, while improving the ability of the formula to benefit circulation and prevent high blood pressure. Lowering blood pressure with hawthorn is a rational side effect free choice for those who want to use natural remedies. To learn more about Dia-Slim, our 9 herb formula for weight loss and sugar cravings, you can read this short letter I wrote to patients. To buy Dia-Slim now check out our shop here. 1. Walker AF, Marakis G, Simpson E, et al. Hypotensive effects of hawthorn for patients with diabetes taking prescription drugs: a randomized controlled trial. Br J Gen Pract. June 2006;56(527):437-443. 2. Dalli E, Colomer E, Tormos MC, et al. Crataegus laevigata decreases neutrophil elastase and has hypolipidemic effect: a randomized, double-blind, placebo-controlled trial. Phytomedicine. 2011;18:769-775. It is such a beautiful herb that I decided to go big with the photo! 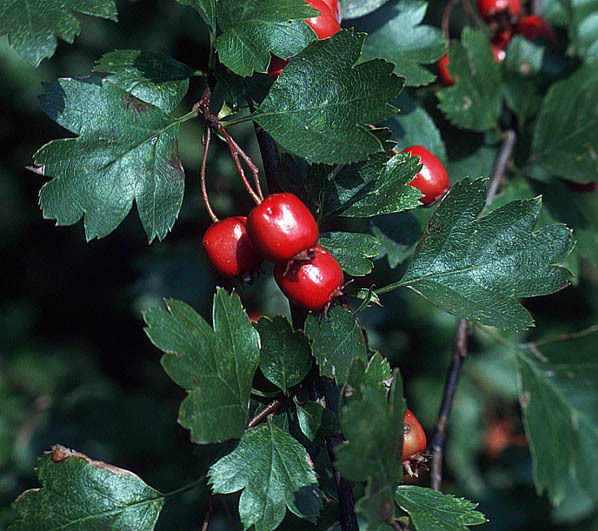 Crataegus laevigata, or hawthorn berry, is an exceptional herb and low risk phytotherapy solution for coronary heart disease, atherosclerosis, hypertension and hypercholesterolemia. Research supports the use of hawthorn berry for the above mentioned conditions. Chinese medicine has used hawthorn berry for over a thousand years. In many formulas hawthorn, called shan zha in Chinese, is used is formulas to benefit digestion and aid circulation. The herb helps the body transform dampness, which corresponds to the herb’s western function of decreasing blood lipids. Hawthorn berry is one of the 9 herbs in Dia-Slim. We added hawthorn berry because as people gain weight, they put added stress on their hearts. Heart health is a huge consideration in obesity. So if you are looking for an herbal formula for weight loss that considers all of the health ramifications that extra weight puts on the body, Dia-Slim is a great choice. Please see the attached monograph on Crataegus, or hawthorn berry to get a better understanding of the research on this herb. Additionally, hawthorn berry is packed with antioxidants and protects cells from free radical damage. To learn more about exactly what is in Dia-Slim and why, click here.